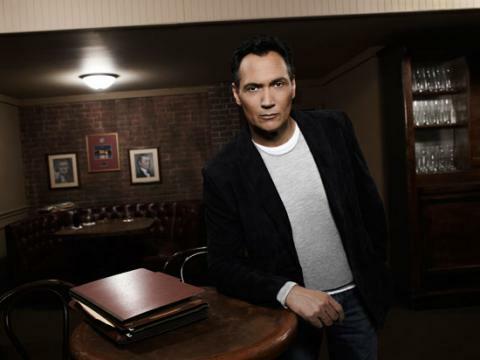 Jimmy Smits is one of the most successful television actors of his generation, with starring roles on critically acclaimed series like L.A. Law, NYPD Blue, The West Wing, Cane, and Dexter. He has earned a total of 12 Emmy and 4 Golden Globe nominations over three decades. His newest show Outlaw premieres tonight at 10 pm on NBC before it moves into its regular Fridays at 10 pm timeslot. Al Norton: Were you looking to get back in TV when Outlaw came to you? Jimmy Smits: I was looking to work (laughing)! Always looking to work. Al Norton: How much do Cyrus' (Smit's character on Outlaw) politics resemble your own and was that part of the appeal? Jimmy Smits: It was part of the appeal but they don't resemble my politics at all. One of the great things about doing what I do is that you can immerse yourself in a different profession, or genre, or time, or in this case, a person with a different sort of political bent than my own, and that's part of what the jump off point in the series is. It's exciting on a week-to-week basis because we're tackling some of these substantive issues in the legal realm and we get to see all points of view on a particular topic. Al Norton: Did a lot of the legal terms come back to you from L.A. Law? Jimmy Smits: The "objection" thing wasn't too hard to remember (laughing). In all the work that I do, if there is a technical advisor on the project, I rely on them heavily. We just finished doing an episode about an extradition case, dealing with laws that pertain to a different country. To me that's the fascinating part of what I do, because you really have dive into that stuff as an actor and hopefully that transfers over to the audience in terms of what are we are doing each week. Al Norton: You've got a great group of actors working with you on the show; how involved were you in the casting process? Jimmy Smits: It's funny that you mention that because they really are a wonderful ensemble. I'm really proud of them. I can't wait until the show sets sail. On these types of character driven shows, as opposed to procedurals, it's all about the audience getting engaged with each of the eccentricities of the particular characters and wanting to go on a ride with them. Somebody like Dave Ramsey, who I've worked with three or four different times on The West Wing, and Dexter, and we just did a movie together last year, and Jesse Bradford, who was also on The West Wing and is a phenomenal actor, I can't wait until the audience gets engaged with them and sees them doing their own cases. Ellen Woglom and Carly Pope round out our cast and they're just a really, really talented bunch. Al Norton: It must be nice to get such a big vote of confidence from the network that they are premiering you after the finale of the number one show of the summer. Jimmy Smits: Yes, I'm really exciting about that. We'll hopefully have lots of eyes and get repeat customers when we move over to Fridays. That was a nice gesture by NBC. We're not the high concept show on the network's schedule this particular season but we're a substantive show, we're a show that has humor and great stories every week. As you say, Al, it is a real vote of confidence on the network's part and we're very grateful for it. I'm very excited about this week. Al Norton: The last few years Friday nights have been a dead zone for TV programming and all of a sudden, with Dana Delany on ABC and Tom Sellek on CBS, it's become a TV star night again. Jimmy Smits: You know, Al, every rule in our business has its exceptions. When we heard about going on Fridays some people said, "oh my God, Fridays" but when I think of Friday night TV I think of Miami Vice and Homicide, great shows from Friday nights. The landscape of television has changed considerably because we're in a 200 channel universe but there are still folks at home wanting to see good stuff and hopefully we'll provide that. Al Norton: How much of an influence do you think pop culture has on politics? Would there have been a President Obama without Presidents Palmer and Santos? Jimmy Smits: Oh my (laughing). I think the Obama phenomenon would have happened either way but it does plant the seed in terms of the readiness to accept in people's minds. During the election a few years ago the episodes I did on West Wing were just starting to air in England and I was getting all of these calls about the similarities between my character and Obama. There was a young Senator at the time we started doing that arc and we talked to him, talked to his peeps, about what they were thinking about in terms of the future. He was one of the many we talked to so it was more art imitating life in that sense. Don't miss the series premiere of Outlaw, tonight at 10 pm on NBC, and then follow it to its regular timeslot of Fridays at 10 pm.